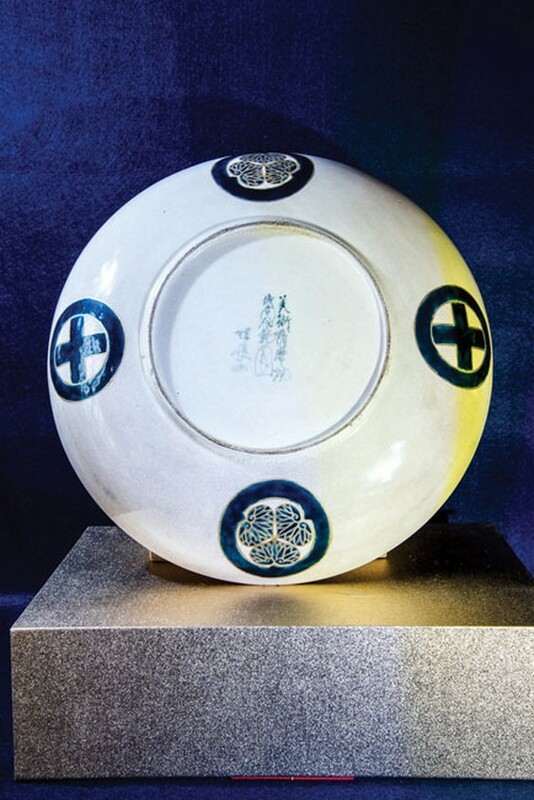 Satsuma pottery is decorated by handily drawing, using Gosu Blue techniques, with a blue light color covering the surface of the ceramic body. The color of Gosu Blue, can be blue, dark blue, green or black, is dependent on the burning degree of the sophisticated artistic expressions. Nowadays, it is hard to find the Imperial Satsuma, a genuine Gosu Blue work of Edo period. 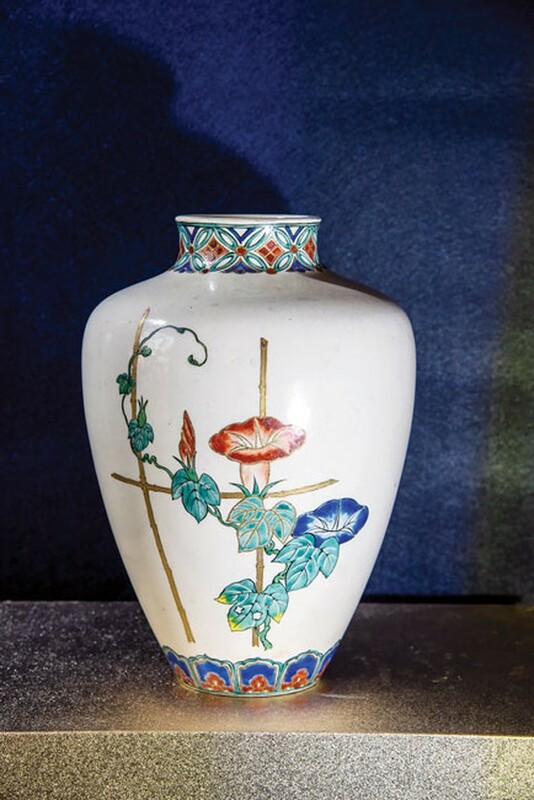 Late of Ming dynasty, from the 16th century to first half of the 17th century, the red and green light painted ceramics with freely bold designs were exported by China to Southeast Asia and Japan. These potteries were called Gosu Akae by Japanese. The uses of brushstroke in painting made Gosu Akae look more vivid in brilliant red color, and this technique immediately changed the Japanese ceramic decoration. In Japanese language, the word "Gosu" means “from the South of China”. This enamel technique was brought to the Arita region, the hub of Japanese ceramics in the early Edo period. Gradually, Gosu had been also known as blue enamel pigment, which was widely used in ceramics production, such as blue and white ceramics. This blue enamel has a high saturation, very special and solid, making it never fades. This technique was strongly applied by the Japanese in the 19th century in producing Satsuma pottery. That explained why they were named Gosu Blue. The Gosu Blue technique make the motifs’ colors becoming brighter and more shimmering. The artists usually use a heavy dark blue, but in case the artist use a slighter color, the painting still hides everything under it. Gosu Blue technique is to handily put the special large Dami painting brush into the "Gosu enamel" and skillfully paint on the ceramic body. The enamel drip is controlled by using fingers to carefully squeeze the broom. It requires to be high skill, concentrated and, and patient to draw handily. The colors are mixing depending on type of season, weather and humidity. Therefore, people never find two Gosu Blue products are identical. Looking at the Satsuma Gosu Blue masterpieces recall us back to the turning point of Japanese economy, when it moved from the Chinese reclusion to autonomy of politics and culture, 150 years ago. The collectors can easily see the differences in Gosu products which were made before and after the 1968 historic transition. 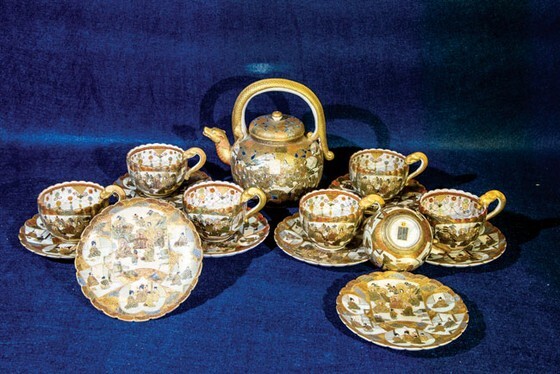 Before 1867, the ancient potteries were used to make tea sets. They used to be decorated by smooth and simple painting motifs. The front of the plate was covered by yellow, blue and white chrysanthemums which are growing by the water stream under a clear sky. In the back of the plate, there was a Mitsuba Aoi or Tokugawa Aoi standing near the Satsuma. The signature and name of Satsuma artist or a bindweed flower were usually in the center of the plate (Figures 1, 2 and 3). 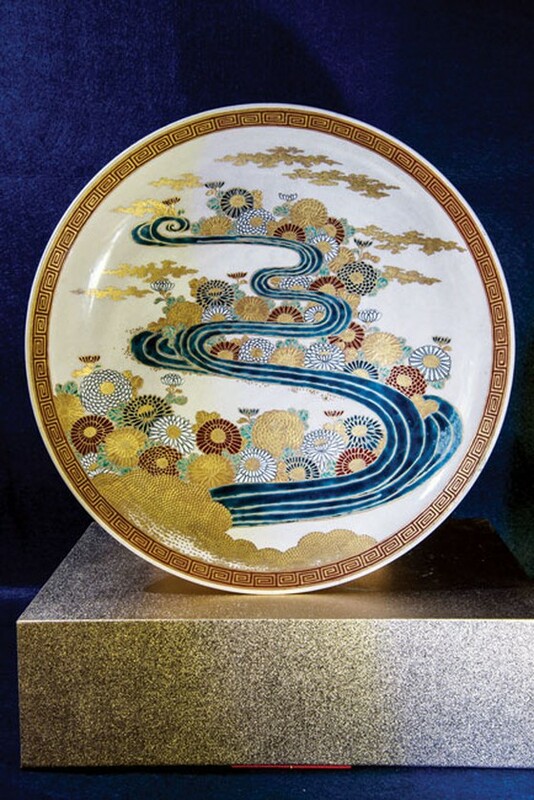 Since 1868, after learning western techniques, Japanese had been using some natural minerals and elements, such as Cobalt or Asbolite in painting the Kyoto-Satsuma pottery. 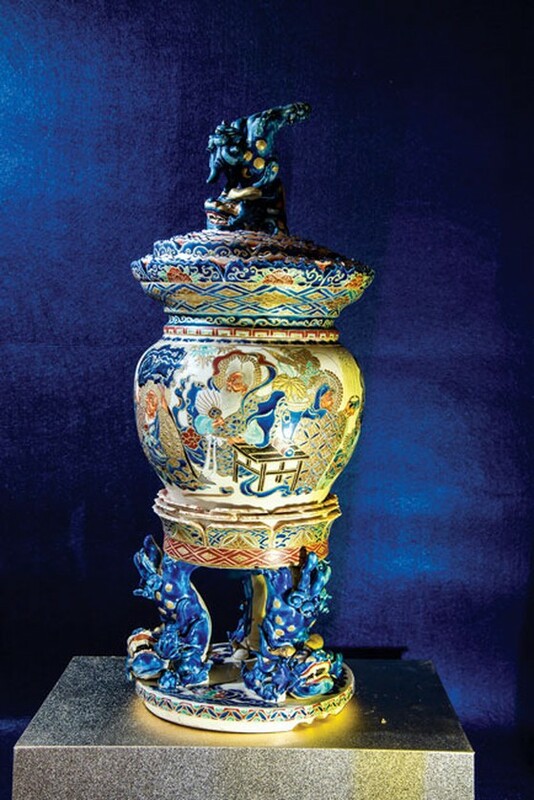 This technique help making the blue light look more luxurious and outstanding although the potteries were fully covered by yellow motifs. 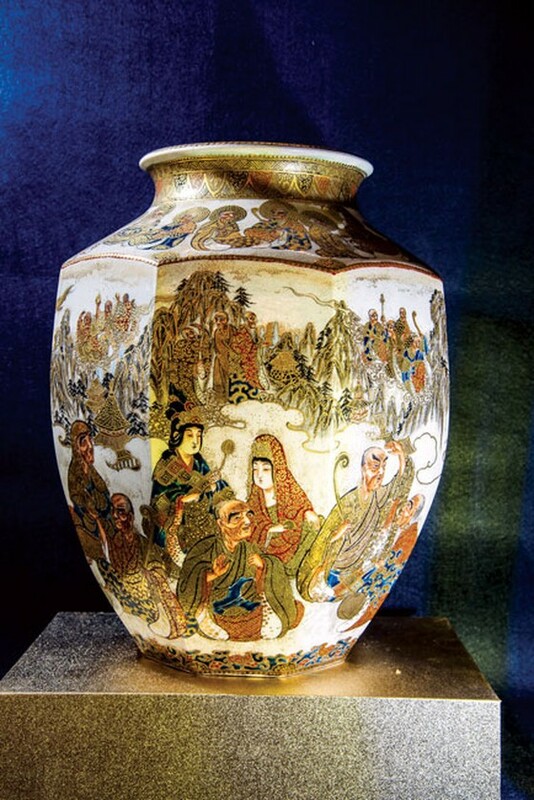 Or the brilliant vase which is painted by the colorful Bodhisattva image (32cm high - Figure 6). (ĐTTCO) - According to 2018 Global Economic Report presented at the World Economic Forum, Vietnam was ranked 96th out of 140 countries in terms of “burden of government regulation”.